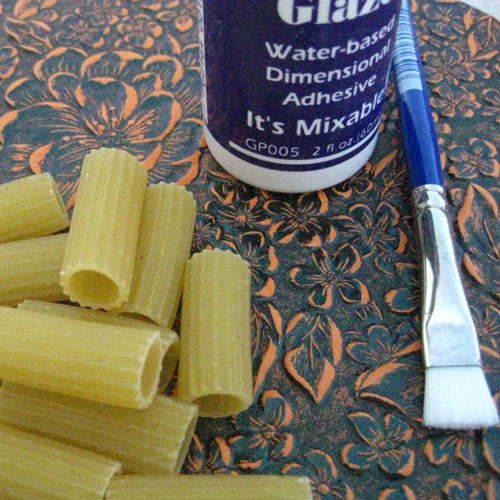 This is a follow up on a previous article on how to make paper beads out of pasta. It is fun, inexpensive and a lot of possibilities. Paper now comes in all prints and texture, if you do not want to use magazine paper, scrapbook supply stores has a whole array of beautiful prints of paper to choose from. 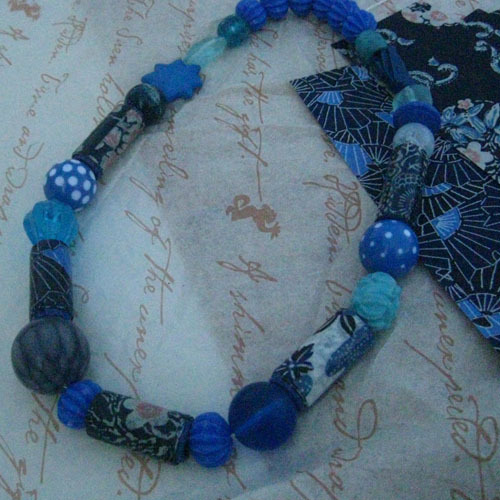 This necklace I made out of origami paper in different hues of blue, this actually came in a pack of eight pages of 1/4 of 8 x 11 paper. You can find this also at a craft store like Michael’s. 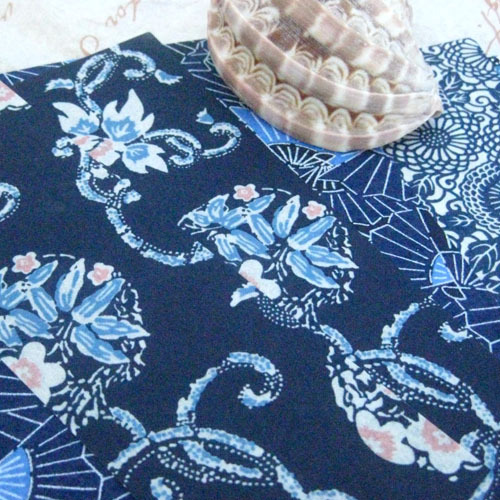 Paper used for this project is origami paper, available at craft stores. 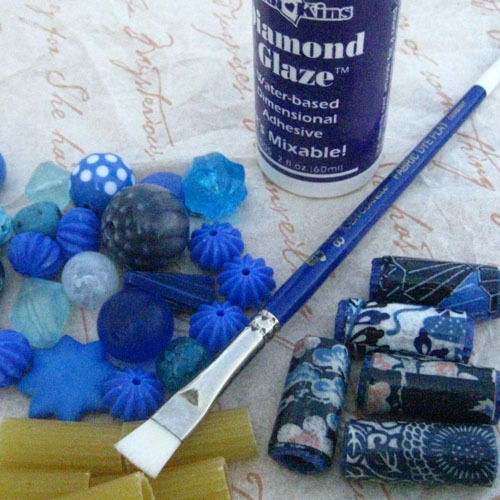 The materials are: Diamond Glaze (www.aubreysbeads.com), brush, pasta (preferably rigatoni), origami paper, repurposed beads from garage sales or thrift stores, stringing material and findings. For instructions and how to please refer to a previous article “Pasta Word Salad Necklace”. 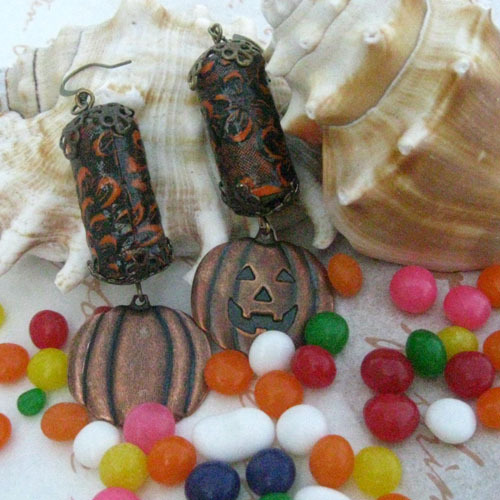 Here’s a pair of Halloween earrings made the same way. 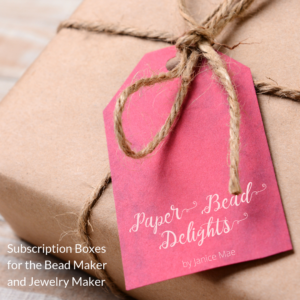 I use bead caps big enough to cover the holes top and bottom of the pasta paper bead, you can use ribbons shaped into flowers or big spacers. The charms I also purchased at a scrapbooking supply store. Here it is! Cost of project, approximately $3.00 and all hand made by you! Enjoy.